Microsoft takes another stab at internet search. Does Bing return the right result? Bing does well in head-to-head tests with Google; it's fast and returns relevant results. Google beats Bing on quantity in most of our tests – but user studies suggest that few of us stray past the first page of results. That's what's important – and Microsoft Bing nails the first page. Like Ask before it, Bing does this by filtering the results it returns. Intelligent algorithms work out if you're looking for a place to stay, for example, and instead of just giving you a list of Page Ranked links, you can click on 'Hotel Deals' and book your visit without leaving Bing. If you're in the US, that is – Bing UK still has kinks to iron out before these services go live. 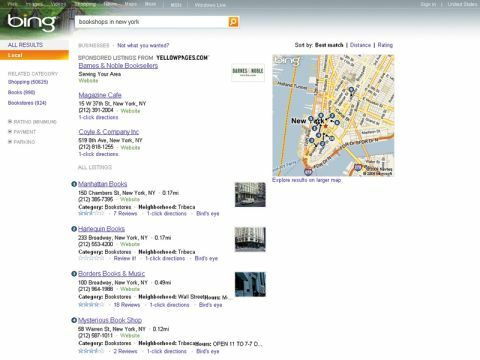 Still, this is Bing's unique selling point: the fact that it integrates comparison engine, partner content and booking into the search page. The integration of different kinds of result is threaded through Bing. Picture results pop up in some searches, for example, enabling you to click through to Bing's impressively laid-out image search. Can Bing steal the search crown? It's a long way from overthrowing the king, but second place seems assured.